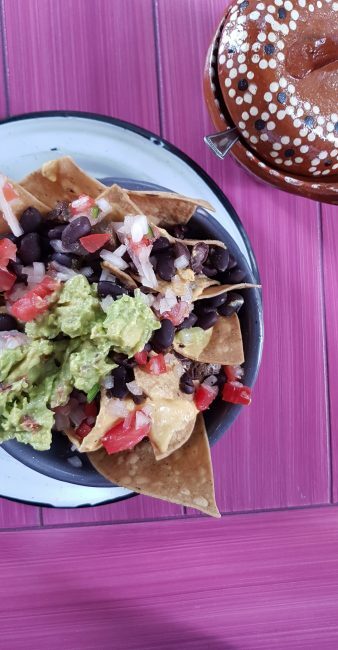 Forever Vegano is a fully vegan and plantbased cafe/restaurant with two locations in Mexico City, Roma and Polanco. Our Airbnb was less than a ten minute walk from the Roma location, so this became our most frequented breakfast spot. On our first visit we opted for savoury dishes and shared the a-huevos rancheros in salsa verde as well as the enfrijoladas, both of which were very tasty. 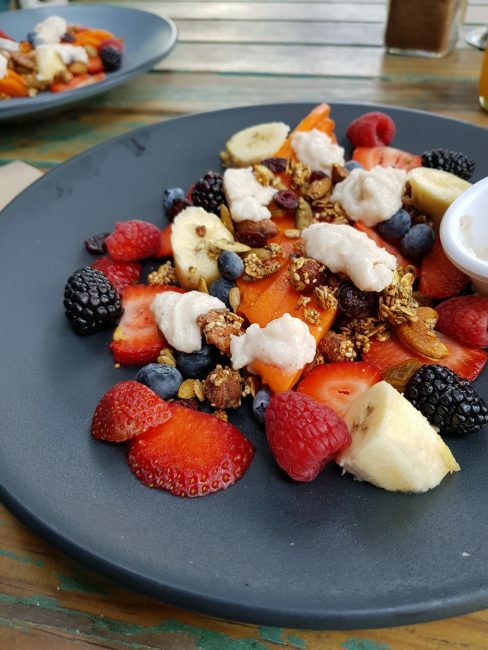 We also tried the pancakes, quinoavena with fruit, and the seasonal fruit plate with granola and coconut yoghurt. Forever Vegano also offer a small selection of pan dulce. These traditional Mexican sweet breads are not easy to find vegan and I hadn’t had them since I was a child. 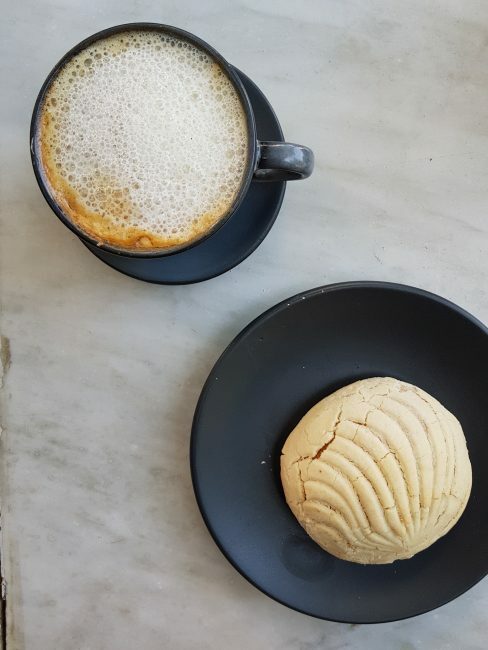 The concha we ordered seemed to be made with wholewheat flour and was much less sweet and indulgent than I remember pan dulce tasting, but it’s definitely a good option if you want to try a healthier and vegan version of a Mexican classic (pro tip: dunk it in your coffee). Staff were very friendly and the food was very affordably priced compared to the UK. We loved that for just 40 pesos (1.5 GBP) more we could add to our main meal a fresh squeezed orange juice or fresh papaya AND a latte or cappuccino with a variety of non-dairy milks to choose from. They also had outside seating which we appreciated as it was a great spot for people and dog watching. 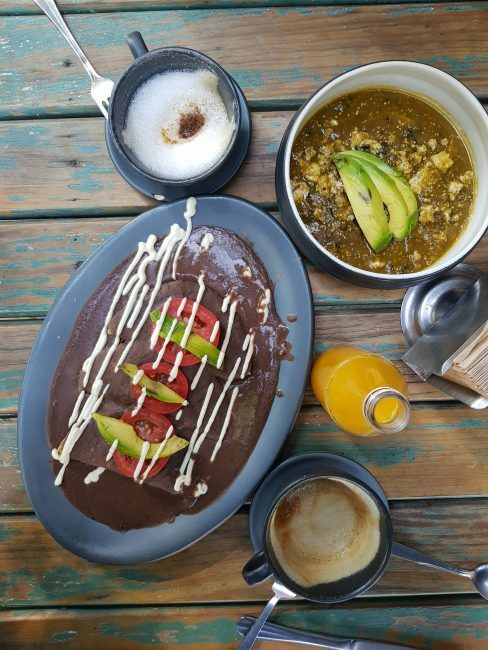 We enjoyed Forever Vegano so much that we ate breakfast here four out of the six mornings we were in Mexico City! 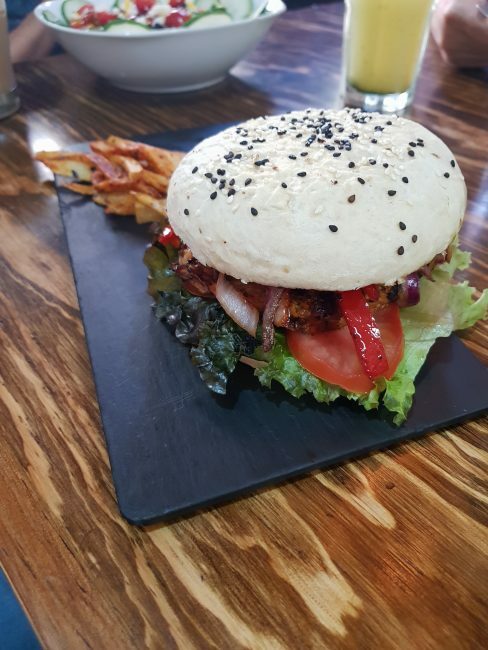 U.to.pia offer a fully vegan menu in a small and cosy space located within a short walking distance from Parque España in the Condesa neighbourhood. The walls are covered with mural of messages supporting animal rights. The main offering on the menu is their pizza, of which they have a variety of topping combinations. 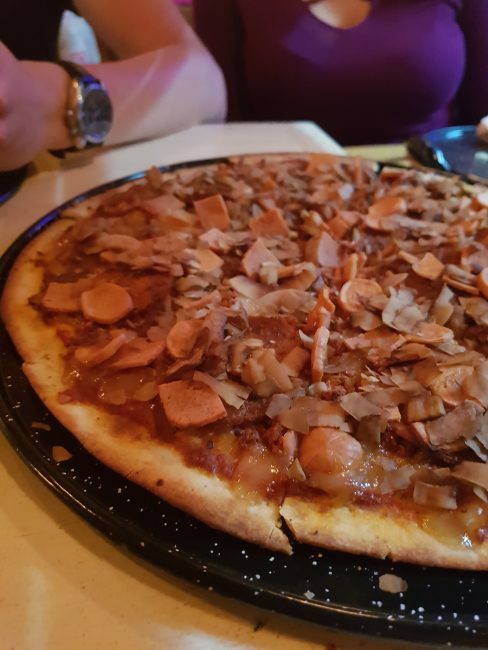 We opted for the ‘meat lovers’ pizza which was topped generously with a variety of vegan meat alternatives. While the pizza was tasty, the absolute show stopper on the menu were the Sopecitos topped with an impressive vegan crema and served with salsa verde. We loved these sopes so much that we came back to U.to.pia a second time with the rest of my family just so we could try them again. 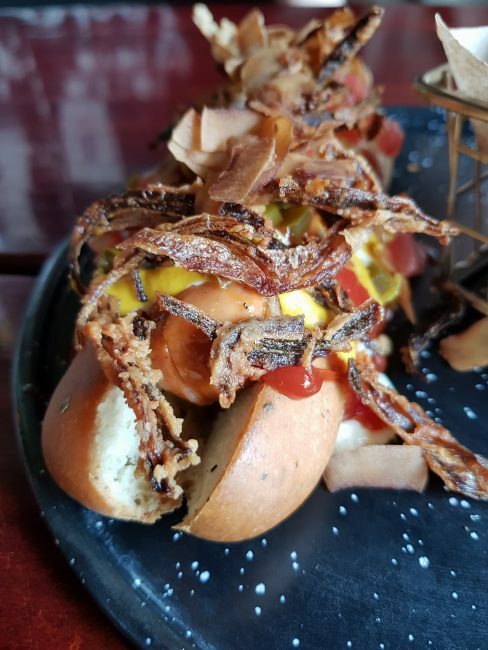 A very close second goes to the hot dogs, which were covered in fried onions and coconut bacon. The drinks here were also great. 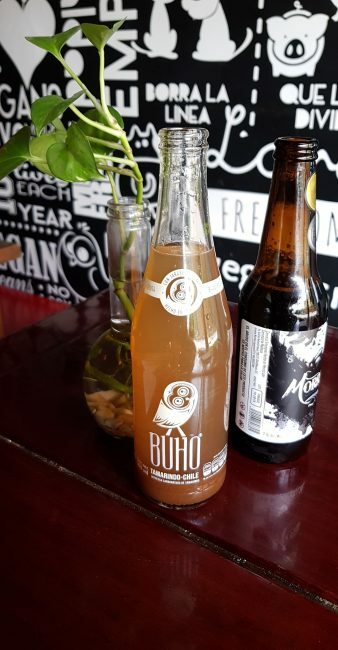 On our first visit I ordered the tamarindo-chile flavoured Buho soda and on our second visit we had their fresh water of the day which was agua de melon- I absolutely loved both! They also offer artisanal Mexican vegan beers and desserts. Well priced- I would definitely recommend! 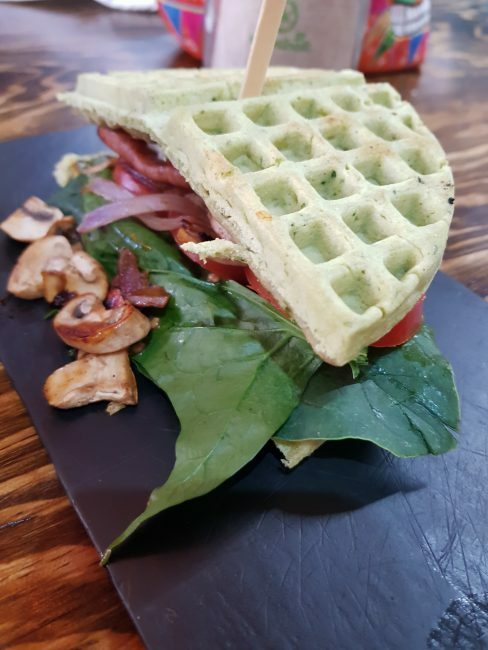 Aura Vegana is a small, fully plantbased cafe located in Coyoacán. Unlike most of the other places on this list, I had not heard of Aura Vegana prior to our trip to Mexico City. I found it on google maps while looking for somewhere close to Frida Kahlo’s Casa Azul to have breakfast before visiting the house. We decided to give it a go and were certainly not disappointed! We ordered fresh juices, coffees, seasonal fruit with granola, and chilaquiles verdes. The friendly server also very kindly brought us freshly baked bread and salsas to try for free. The only thing I seemed to have taken a picture of this morning were the chilaquiles verdes, and they were absolutely the star of the table. Chilaquiles have always been one of my favourite breakfasts growing up and while it’s usually easy to order them in omniverous restaurants as vegan without the cheese and crema, it just doesn’t have the same effect. 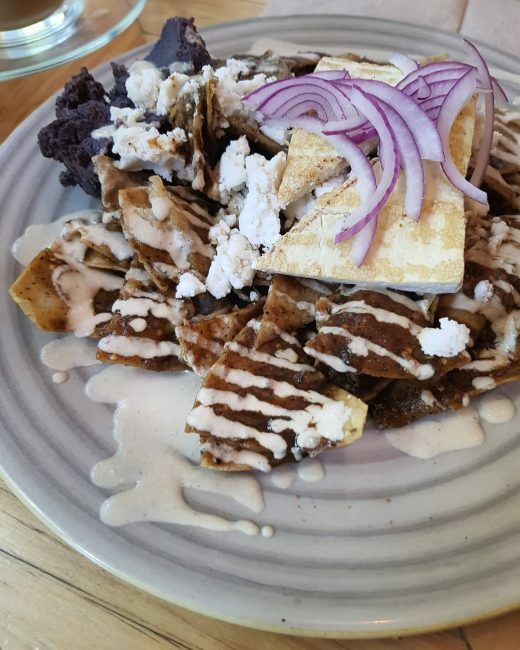 These chilaquiles were topped with housemade vegan crema and crumbled almond cheese, both of which were incredible, as well as some tofu and frijoles. These chilaquiles really hit the spot and we wished we could have come back to have them again! 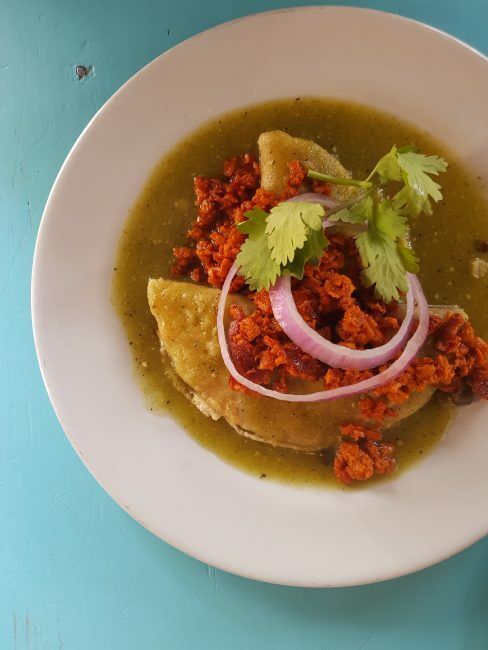 Temictli is a fully vegan restaurant with two locations in Mexico City. We visited the one in Coyoacán, located just around the corner from Frida Kahlo’s Casa Azul. The restaurant offered some outside seating which we enjoyed, as well as offered a selection of vegan food items and cleaning products in the shop which I browsed while we waited for the food to arrive. The staff who serves us were very friendly and took the time to go through the menu with us and give us their recommendations. We shared the half portion of the nachos as a starter which was tasty, but what really blew us away was the torta milanesa. 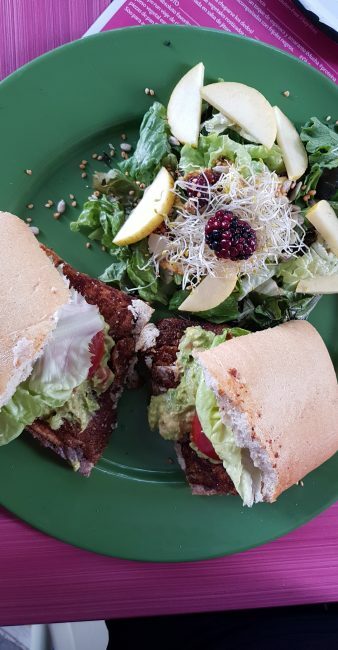 A torta milanesa is a popular Mexican sandwich typically filled with thin slices of breaded fried chicken. This milanesa was made with aubergine and seasoned to perfection. It was so delicious that we couldn’t stop talking about it for the rest of our trip! 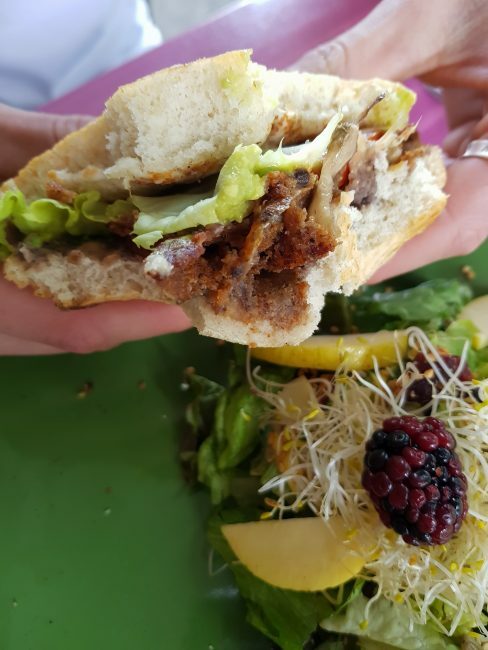 We ordered milanesa tortas and tacos elsewhere in Mexico City after this which we enjoyed very much, but this one was definitely our favourite. 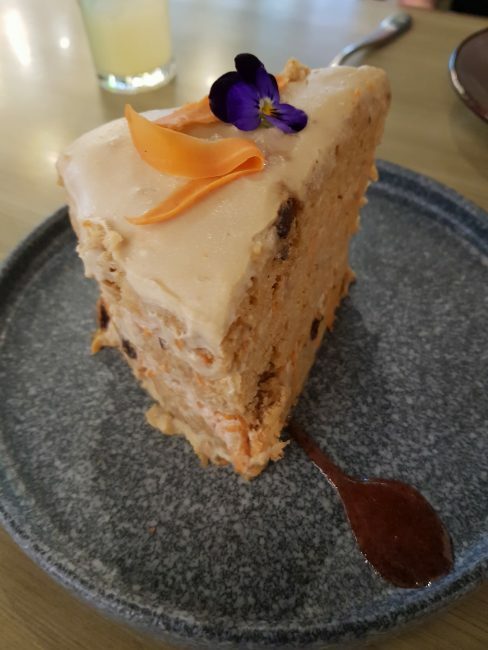 They also offered a variety of desserts and freshly baked pastries which sounded and looked delicious but we were too full to try any so we will certainly have to come back for them! 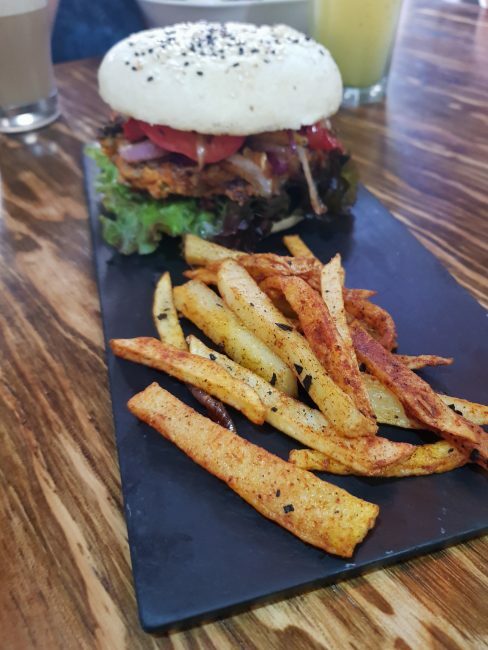 Pan Comido is a fully vegetarian restaurant/cafe which does sell products made with egg and dairy but also offer a wide variety of clearly marked vegan options on the menu. We visited Pan Comido three times during our stay in Mexico City as it was so close to our Airbnb. It’s a bit small, but has outdoor seating and quirky tables made out of what looks like old recycled doors. 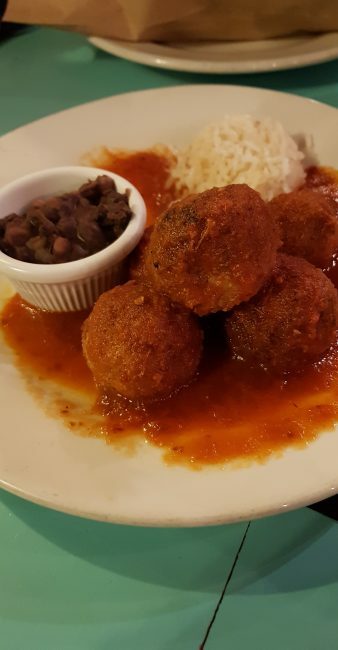 On our first visit we went for dinner and ordered the albondigas (vegan meatballs) and torta milanesa which were both very flavourful. We returned again the next day looking just for dessert but they offer only a small selection of vegan baked goods and had completely sold out of the vegan ones. A few of the milkshakes on offer were able to me made with your choice of either almond or soya milk so we ordered a vegan chocolate chip milkshake to share which was able to satisfy our sweet tooth for the night. The third time we returned with my family for breakfast. 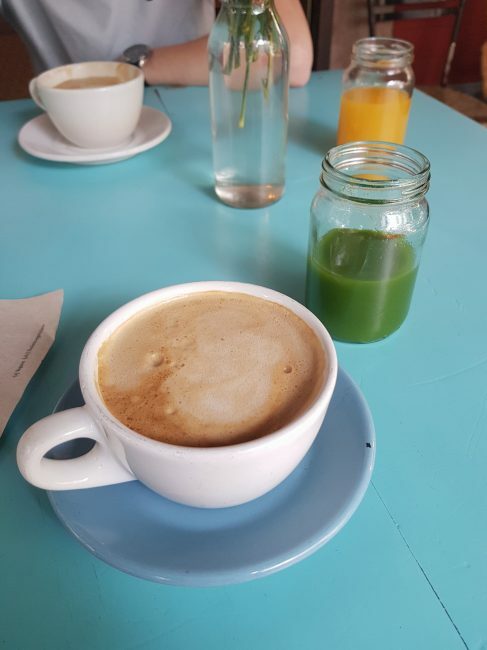 To drink, I ordered a soya cappuccino and a freshmade green juice which was extremely refreshing and delicious. We then ordered the vegan enchiladas in salsa verde with extra vegan chorizo which we both really loved! To make up for the other night, we ordered one of the chocolate vegan cookie/brownie desserts to take away before we left and enjoyed it as a tasty, sweet snack later in the day. 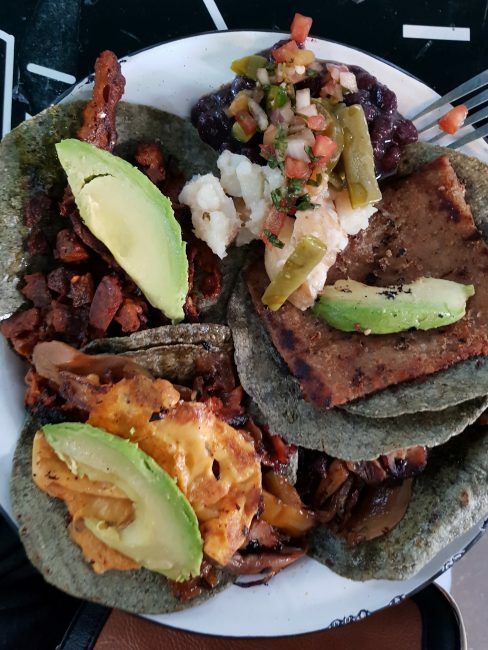 Por Siempre Vegana Taquería was recommended to me by so many people before we travelled to Mexico City that I was almost scared it wasn’t going to live up to the hype I had created around it in my head. Let me tell you now though that this place did not disappoint- it absolutely exceeded my expectations. Por Siempre is fully plant-based, promotes a positive message of animal rights and welfare, and offers incredible value for money. 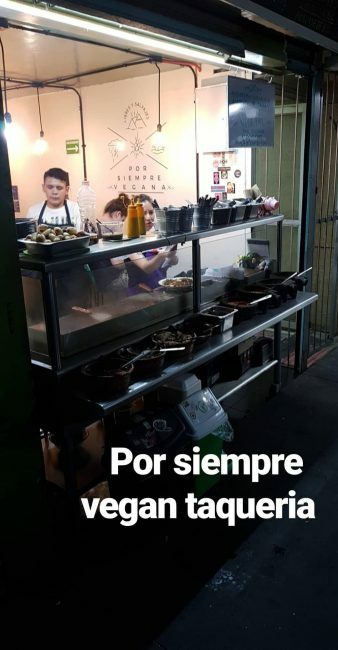 It started as a vegan taco truck in Roma Norte (which still exists) before opening in a small location nearby that offers a few tables and table service called Por Siempre Vegana Taquería 2. We visited the second location and chose to come back again on our last night because we loved it so much. The menu is quite extensive and offers vegan versions of Mexican staples that you would normally see in any other taquería. 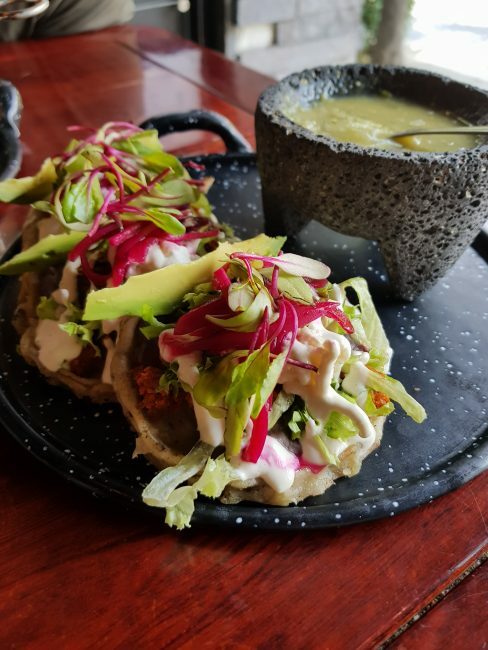 You can order any of the tacos on the menu as tortas if you prefer, and there is also a selection of other typical dishes such as flautas and some dessert options as well. We came after visiting Teotihuacan all day and hadn’t eaten anything since breakfast and were hungry! We ordered four tacos each which came as copias, meaning it had double tortillas. The fillings were generous enough so that we could split them between both of the tortillas and ultimately make eight tacos each. All of them were delicious but we particularly loved the milanesa, chorizo verde (con queso), and al pastor with cheese and avocado. There is also a selection of unilimited side dishes and salsas on offer such as potatoes, frijoles (beans), nopales (cactus), pico de gallo, chimichurri, etc. If you are sensitive to spice make sure you ask them which salsas are spicy as one of them was even too spicy for me and I love spicy food! Not only was the food so delicious and plentiful, but it was extremely inexpensive. Eating out in Mexico at restaurants is already considerably cheaper than in the UK or the US and street food and taco trucks are even cheaper. The prices at Por Siempre Vegana Taquería are comparable with other food trucks and taquerías, with tacos ranging from 15 to 20 pesos (.55 to .75 GBP- less than a pound each which in reality is actually two tacos) and you can add extra vegan cheese to any taco for 5 pesos (.18). Por Siempre Vegana Taquería might just have to be my number one recommendation for where to eat in Mexico City- do not miss this place!! Vegan Inc. is a fully vegan restaurant located in the Antara Shopping Centre in the wealthy neighbourhood of Polanco. It is within a short walking distance of the Museo Soumaya (one of the few attractions in Mexico City open on a Monday) so we decided to come here for lunch before visiting the museum. Though it is essentially part of a food court in a mall, it was probably the ‘nicest’ place we ate in throughout our trip to Mexico City. The place had an overall modern feel with servers dressed in formal black and white attire. The servers were friendly and extremely patient with us as we took a while to choose what we wanted from the wide selection on the menu. 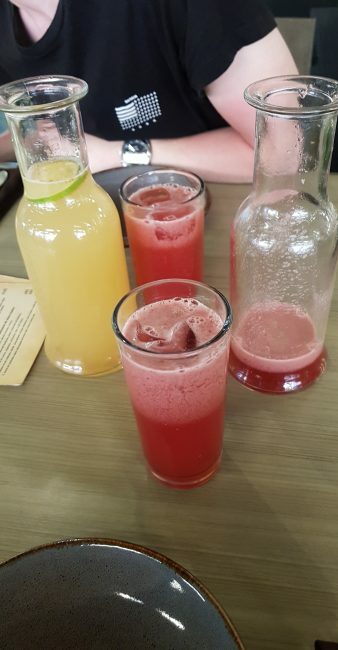 While we took time to decide we ordered two aguas frescas, one with ginger and lemonade and one made with berries- both were fantastic! They also brought us a small complimentary starter of what seemed like a vegetable and bean dip which was nice. 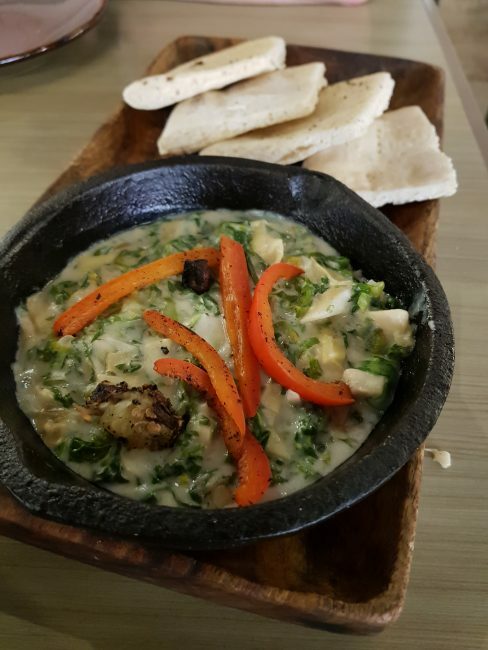 As an appetizer we ordered the spinach and artichoke dip- this dish was really flavourful and we both enjoyed it a lot. 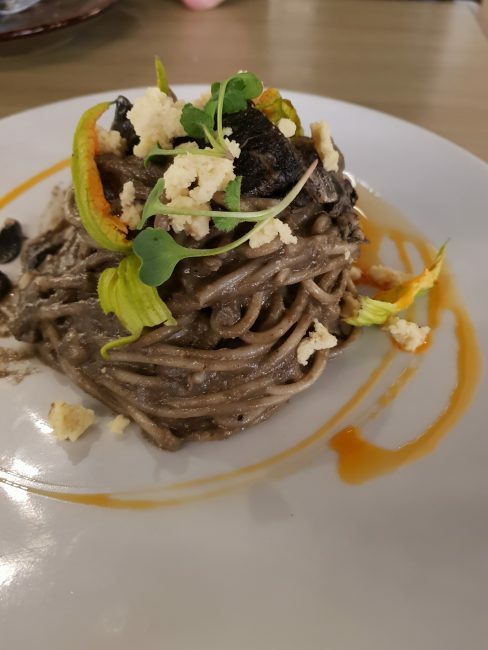 We were tempted by other items on the menu such as the sushi which I had seen on Fat Gay Vegan’s instagram but decided to opt for Mexican inspired flavours and instead ordered the vegetables in mole and the huitlacoche pasta. 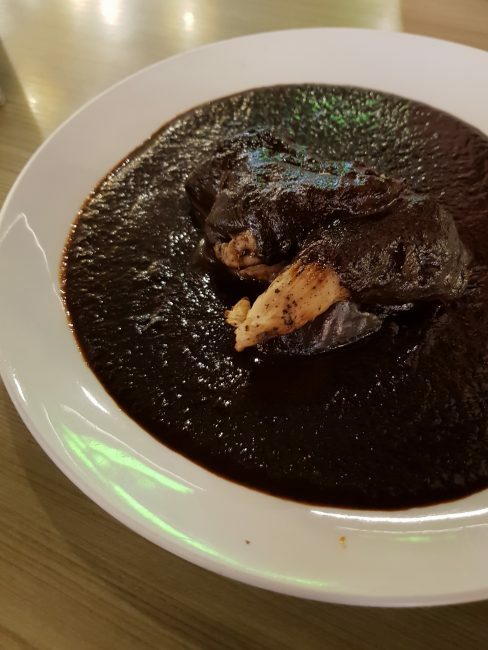 Mole is a typical dish from Puebla, my family’s hometown, which I hate to admit has never been my favourite thing in the world. I have come to realise over the years that different regions and recipes make mole in a variety of ways with differing prominent flavours and there is a very narrow range of mole variations which I have tried and truly enjoyed. I wasn’t a huge fan of the version here as it had quite a strong star anise flavour, though this might just be a reflection of the mole I am used to rather than the standard of the restaurant overall as we really enjoyed the other things we tried. Huitlacoche is a Mexican truffle or fungus which grows on corn and is a staple in our cuisine and one of my favourite things that my mother cooked for us growing up. My partner likes but doesn’t love huitlacoche, but we both loved this pasta. The sauce was so creamy and had such a unique and tasty flavour, and it was topped with a housemade vegan nut cheese which was delicious! Though we didn’t really have room, we still opted for some carrot cake for dessert. 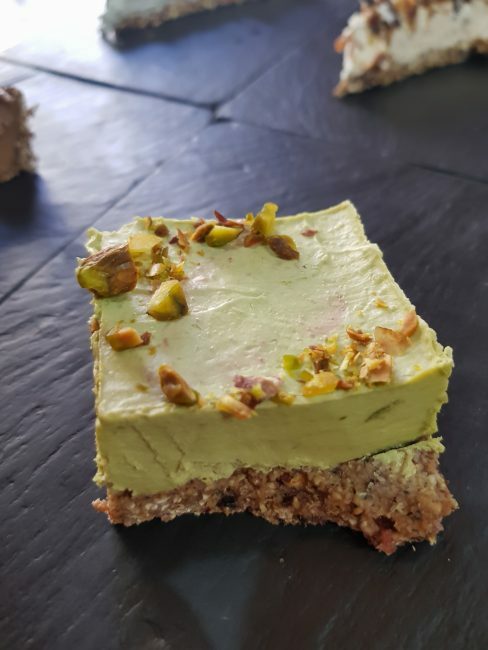 It was a bit on the gummy side in terms of texture but I didn’t actually mind that on this occassion and the flavour was spot on! One thing I have to mention is that Vegan Inc was definitely the most expensive place we ate in Mexico City by far. Our entire meal came to about 800 pesos including tip which is about 30 GBP. This would be quite a reasonable price for a nice meal in the UK or the US but for Mexico City we thought this was pricey. We didn’t eat out anywhere else in Polanco, so I am not sure if this is normal for this particular neighbourhood as it is more upscale. Regardless, we were more than happy to pay this amount for the quality of the food and service we received and would definitely go back! Vegamo MX is a small vegan restaurant/cafe with a fully vegan menu located in the historic centre of Mexico City. 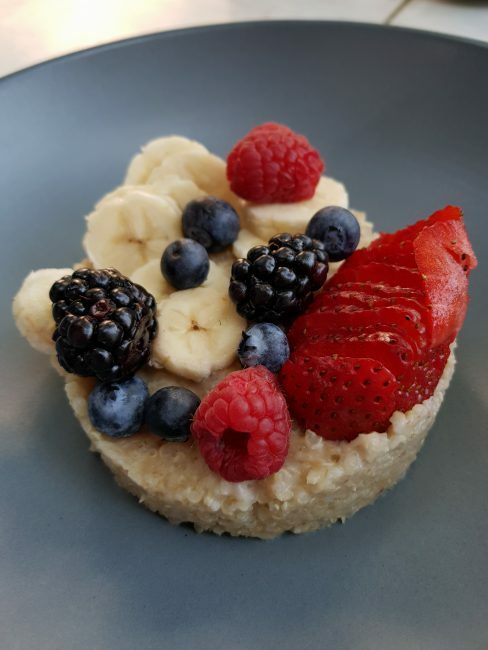 The menu is varied, offering pizzas, burgers, pad thai, pasta, wraps and more, as well as breakfast and an impressive variety of raw cheesecakes. We went for lunch and split the BBQ Burger and the Chewbacca Waffle Sandwhich. Both were tasty but the BBQ burger was definitely my favourite as it was the most flavourful. For dessert we decided to go all out and shared one slice of each of the raw cheesecakes. I highly recommend the snickers flavour if you’re a peanut butter and chocolate fan! Vegamo MX is just a short walk away from main attractions such as the Palacio de Bellas Artes so it’s well worth a visit in between sight seeing in the city’s historic centre. 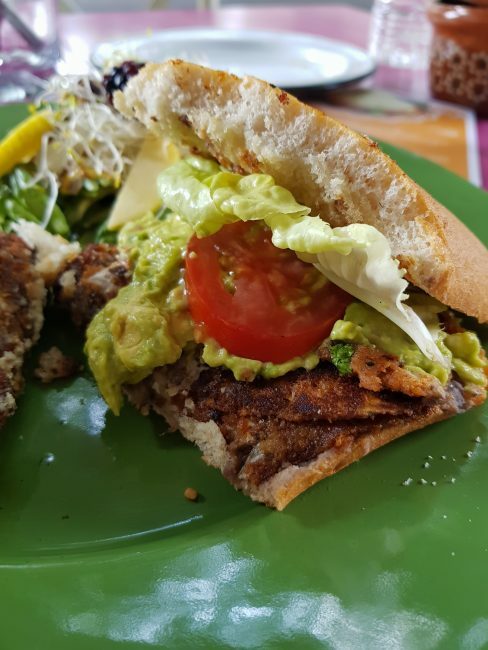 We were honestly overwhelmed by the amount of vegan restaurans and options in Mexico city – we were spoilt for choice and didn’t struggle in the slightest finding delicious food to eat in the areas we were in. Unfortunately, we were only able to sample a small percentage of the vegan food this fantastic city has to offer, so this list is by no means a definitive guide as there were so many more places we wanted to go but didn’t have the time. This is just another incentive for us to come back! Feel free to share any of your favourite places in DF so that we can try them on our next visit and update the list! Mexican food is one of the best in the world, being able to eat Vegan Mexican Food is absolutely a dream come true! All those dishes look amazing, I am grateful I have been able to taste a few of them. Let’s hope more vegan restaurants appear not only in Mexico but all around the world!